In her latest round of reviews, TDmonthly Magazine’s Psychologist Mom strategized her way through a new board game, learned how to live a healthy lifestyle, and scribbled with some artsy kids. 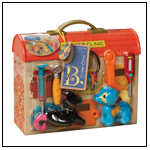 The Dr.'s Impressions: This 12-piece wooden puzzle shows a school bus filled with students. The large, high-quality pieces are brightly colored. Kids’ Perspective: The 4-year-old who saw this puzzle was thrilled to play with it; it was challenging, but not too difficult for him. He liked seeing the children and puppy that were pictured, and he took it apart and put it together a number of times in a 15-minute period. Recommendation: This is a great price for such a quality wooden puzzle. It’s very sturdy, and it could handle being played with thousands of times. The Dr.’s Impression: Tri-Cross is a strategy board game for two to four players or teams. It plays like a cross between chess, checkers and Stratego. The board is well designed and the pieces are nice and solid. 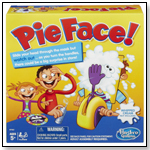 The instructions provide several variations of play. 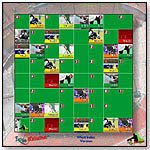 The goal is to capture the opponents’ dice and move to control the center square. Kids’ Perspective: I played with my husband and two sons, 9 and 12. It took quite a bit of effort to figure out the rules, but once we did, it was a quick and fun game. My son said it was like poker. How he knows that is anybody’s guess. Recommendation: Tri-Cross does not have the look and feel of a game that instantly makes you want to play. The ease of play and quickness also deter the player from understanding how interesting this game can be. After “forcing” my family to play four or five times, the boys now play on their own and love it. The game is all in the strategy. The Dr.'s Impressions: This self-help DVD is part of Trevor Romain’s series. Romain aims to educate and comfort children through a mixture of animation and live action, encouraging them as they deal with everyday issues and difficult situations. In this 30-minute DVD, Romain issues a 30-day fitness challenge and explains the importance of a healthy lifestyle. Kids' Perspective: Younger kids (4 and 6) liked this more than older kids (10 and 12). The older ones had heard the message before; the younger ones really liked the animation and visuals. Recommendation: Good health information is presented in an entertaining way. It’s a positive way to introduce children to some basics about fitness and health, as Romain’s persona appeals to children. 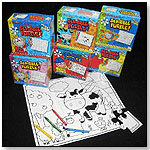 The Dr.'s Impressions: Scribble Puzzles feature big puzzle pieces with a black-and-white design. Children color the puzzles themselves. The wipe-off surface allows them to color more than one time with wax crayons. The puzzle is 12.5” x 15”. Kids’ Perspective: The chunky pieces were easy to manipulate, and the 6-year-old girl who played with the product was particularly enamored with its ability to be colored differently over and over again. A 10-year-old girl also enjoyed making different pictures on the puzzle. Recommendation: This is a very nice, well-made puzzle at a good price. It would be perfect for using on a trip or as a small gift or party favor. The 24 pieces must be colored with wax crayons only. Kids’ Perspective: The colorful game appealed to the 10- and 12-year-olds I showed it to. When they realized, though, that it had a lot of detailed questions about cricket, a sport they don’t know, they lost some interest. Recommendation: EeZee Kricket would be great for a fan of the game. For those without an initial interest, the learning curve would be pretty steep. It is a beautiful and well-thought-out game, but doesn’t appeal to those who are not already cricket fans.